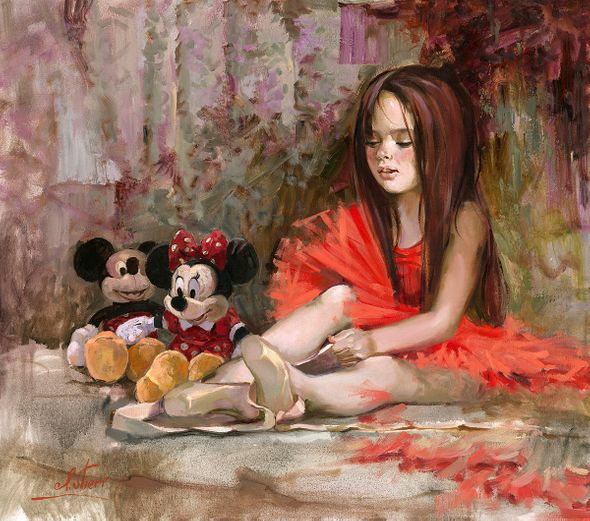 Irene Sheri Signed and Numbered Limited Edition Hand-Embellished on Hand-Textured Canvas:"Before the Lesson"
About the Artist: Irene Sheri was born in the city of Belgorod-Dnestrovsky, Ukraine where, as a young child, her passion for art began. It all started when Irene's older brother Vasily, then 9 years old, was given a set of paints for his birthday. Irene was told that they belonged to Vasily and not to touch them! Those forbidden paints became an object of desire for her, almost an obsession, until finally she stole them from her older brother, mixed them and painted on paper, walls, on her dress, and on the bodies of her friends. She was 4 years old and had found her true love. "I am in love with my canvases," says Irene. "It is the beauty and passion of painting and the results that come from those feelings that drive me to fill the canvas every day." Like her obsession for art, Irene's love for Disney began at an early age. As a little girl, she formed a bond with Mickey Mouse and like many children she thought of Mickey as another childhood friend. "It seems to me that we grew up together," she says of Disney's famous mouse, "I really believed that we were peers." Despite the strong connection she felt with Mickey, Disney items were hard to come by in Russia during that time and the relative scarcity of a Disney toy made them very special items. "When I was young, if you had a sticker with Mickey on it, that was considered something fantastic! It was impossible to find them in our stores," Irene explains. "The only way to get them was as a gift from friends or relatives who were athletes or sailors, since they were able to travel around the world." Luckily for Irene, her friend's father was a Sea Captain and he had brought her a Mickey Mouse sticker from his travels. The greatest gift! She loved it so much she would redraw the Mickey artwork she saw on her sticker. It was at that point that her love for art and Disney merged for the first time. Irene would grow up to enjoy many successes and came to be recognized as one of Russia's most gifted young artists. Instead of attending a traditional high school, Irene was accepted at Grecov College of Art in the city of Odessa, Ukraine. As a follow up to that, at age seventeen, she was accepted into the acclaimed Serov School of Fine Art in St Petersburg, Russia where she would later graduate as Valedictorian. After that success, her post graduation education continued at St. Petersburg Academy of Art, one of the most prestigious art schools in the world. Today her award winning fine art is collected, exhibited and celebrated in a variety of museums and galleries around the world, and in a beautiful, poetic return to her own youth, she contributes to the Disney Fine Art collection with her whimsical portraits of children immersed in the joyful exploration of their own imaginations, the way young Irene Sheri, once did with her own childhood friend, Mickey Mouse.